Neverwas is the highly anticipated second installment in the Amber House trilogy. This book starts off on quite a spin. At the end of Amber House, Sarah rescues both her little brother Sam and her aunt Maggie from the dream world which changes the course of the future. Neverwas is consequently based on an alternate present — a time when the Nazis won WWII; when the world continents are divided under the oppressive commands of the German and Japanese empires; and when racial segregation is still routine. In comparison, Neverwas is a departure from its predecessor. It is bigger and more ambitious in scale, moving away from domestic drama into an all-out, no holds barred, twilight zone-esque fight to save the “real” world. It is still frightening, still mysterious and still gripping — only that the source of these fears and mysteries have slightly changed along with history. In other words, it is still creepy but for other reasons. Since the setting and atmosphere is in a way distinctly different to the one established in Amber House — which was more Gothic, more Romantic — the challenge is to write an alternate universe while still maintaining the essence readers grew to love in the previous novel; a little bit like the supernatural device used in the books…a different shell but containing the same soul. This is impeccably done by the writers. All three women are in sync with their vision and the language they are using to tell it. And the environment in Neverwas is quite different. Sarah, for one, is changed from the first book. Having saved Maggie, Sarah’s entire lifetime is altered — not only by the sudden change in her family life but also by the change in history, which changes the status of women. She grows up into someone a little more sheltered, a little more cautious, a little more proper. But the growth in her, her journey into finding and becoming the “old” Sarah, is worth witnessing. Maggie and Sam also play a lesser role — which I found unexpected considering so much of the first book centered on Maggie’s absence, Maggie’s death and later, Maggie’s rescue. Sam on the other hand is just complete pleasure, so missing him was a little disappointing. Richard, oh Richard. I think we might discover some converts after this second book, that’s all I’ll say. Claire, Richard’s mom, plays a new and intriguing part, one that I hope to see very well explored in the third installment. As for Sarah’s relationship with her own mother — which in the first book is such an integral factor to Sarah’s nature — it has shifted into a different kind of tension. And Jackson, still perfection. And that’s all I’ll say. While the house and Sarah’s ancestors are still at the heart of the story, there is a heavy addition of social and political issues that Sarah must come to understand and inevitably fight against. Her family is involved in political election, racial discrimination layers tension between Sarah and Jackson. This slight shift in focus, along with the missing sentimental pull of Maggie and Sam, the drama between Sarah and her mother, and the romantic question between Sarah and Jackson, might be the reason for the narrowed emotional impact of Neverwas. Don’t get me wrong, its punches will still make readers’ faces crease and their eyes water, but compared to Amber House, this second installment feels less intimate. Though slower-paced, Neverwas remains a success. Its ambition is impressive and the social and political topics tackled is a testament to the breadth of the writers’ talents. As mentioned, it is different. But it is still Amber House. Be sure to visit us tomorrow, when the official Neverwas tour stops by The Midnight Garden! We’ll have guest posts by the three authors, as well as a giveaway for this lovely book. 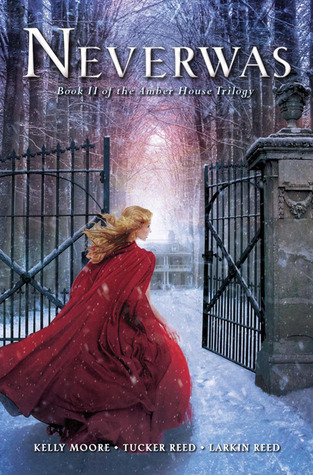 Tags: 2014 4 star books amber house K.
I love the cover for this and Amber house and want to start the series. This sounds like a really intriguing novel. I love the supernatural, and it looks like the story continues strong into this second installment in the series. I’ll have to pick up Amber House sometime, so I can read this one! This is a series I’ve been curious about. It sounds wonderful! Ooh this series does sound good! And the cover is so pretty! I don’t read a lot of gothic books but sometimes I get in the mood for something dark and mysterious like this. I’ll keep this one in mind. Wonderful review, I must admit the series is new to me, but you have me curious about the world and the author’s command of it. Lovely review I am adding this series to my wishlist. Seriously, I can’t imagine writing with two other authors! Can you imagine the conversations involved? The character battles? I haven’t read the first in this series, though I heard it was pretty darned good. Interesting how much has changed from one book to the next. I know, Mary! I think I would be constantly arguing over ideas and such if I had to collaborate on a book with not just one person but two. And family no less, haha :) I really loved Amber House and I know this isn’t a super popular series but I hope it gets the credit it deserves. Read it, please! Ooh I never knew that this was a gothic novel! I might consider reading this series now since I’ve been needing to read more of those–I’m just a little concerned because I’ve read rather ‘meh’ reviews which point out a lot of things I normally hate. The first installment is more Gothic than the first but Neverwas certainly still maintains that atmosphere. I personally love the genre so coming across this series was a real joy. I hope it is for you too. Wonderful review, K. :) I totally agree with you, it was definitely on a more ambitious scale the the first book. The alternate reality was frightening. I did feel it was a little less intimate than the first book, as well, especially in regards to Jackson and Sarah’s relationship. I hope everything works out with those two. I’m a little anxious with how things turned out in the end! I know exactly what you mean about Jackson and Sarah, Rachel. I wanted so much more just because I love him ;) But I don’t doubt there’s more to come. Hmmmm, I have Amber House in my list of books to read, and I have been very intrigued about it but haven’t got to read it yet. Now that the sequel is coming out I think it’s the perfect time to read it! Great review, even if I skimmed a bit to try and not spoil myself too much! Pili recently posted…Cover Reveal with Xpresso Book Tours: Bad Blood by Nikki Jefford!! I said pretty much the exact same thing to K about this, hah–I’ve had Amber House forever! Her review last year was so good, I don’t know why I haven’t gotten to it yet. Well, I do know–too many books and too little time, but her positive response to this book makes me kick myself, hah. She’s away on vacation, by the way, which is why I’m playing host today. :) But she’ll be back next week! Now is the time Pili! I’m so excited for people to discover this series because I think its so good. Its good writing, good ideas, good everything :) There wasn’t much spoiler in my review but its ok that you skimmed. I wouldn’t risk it either. I missed the first book. :( But this sounds fantastic, and that cover- wow! Also, this is the first time I’ve seen a YA w/ three authors. Boggles my mind! I haven’t gotten around to reading Amber House either, but it sounds amazing! I’m curious about how the three authors will work with narrative voice in this installment, too. I’m glad to see that someone else enjoyed this one too! I agree that it was a little bit more difficult to relate to the characters, but it didn’t affect the overall feel of the book. Great review! I really need to read more of the older classic gothics, but one recent YA gothic I love is Blythewood by Carol Goodman; K and Kate also really like Unspoken and Untold by Sarah Rees Brennan. Also, I have a gothics shelf on GoodReads if that helps. :) You can see the “to read” list is much longer than the “read” list! I agree that it was a little difficult this time around what with the alternate reality but I think once you’ve become comfortable with it, it feels the same as the first time. Thank you!